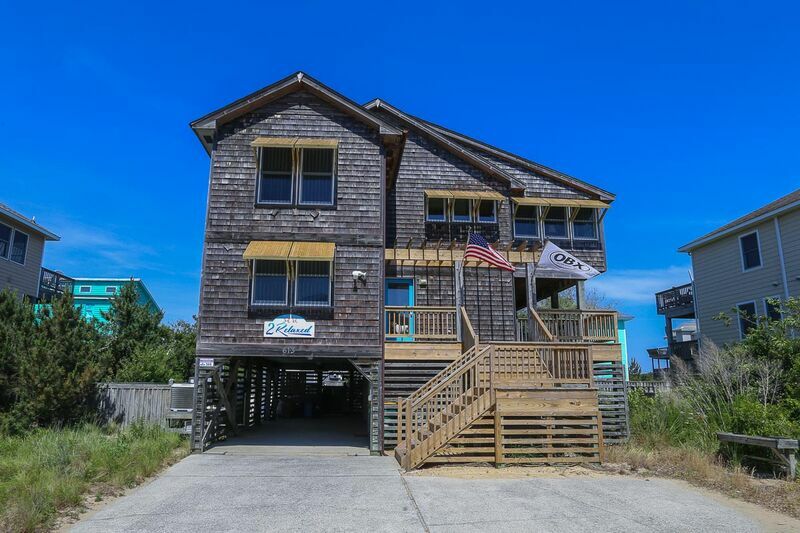 This gorgeous oceanside home is just steps away from the uncrowded beaches of Section E in Corolla. For golf enthusiasts, the Currituck Club golf course is located directly across Route 12. Enjoy the spectacular ocean sunrises, sound sunsets, and ocean breezes from the 360 degree view of the rooftop deck! Within walking distance to the Harris Teeter grocery store, this home is sure to meet your every need. 200 yards to beach access. What guests have said about “2 Relaxed” "Your home was absolutely perfect . . . we loved the house, you thought of everything . . . your home is beautiful, with all of the amenities we could ever want!" 1 bedroom (with Twin with Trundle, can be converted to a King, CATV/VCR/ DVD player and stereo/CD/cassette player). Full hall bath. PlayStation 2 (bring or rent games), electronic games. 4 bedrooms (master bedroom with King and CATV/VCR/DVD player, private full bath; 1 with Twins, CATV/VCR/DVD player and 1 with King - both with deck access and hammock swing on deck; 1 with Queen), CATV/VCR/stereo; full hall bath. Safe, gated deck for toddlers and your pets. Master bedroom (with King and CATV/VCR/DVD player, private full bath). Beautifully decorated great room with CATV/VCR/DVD player, stereo/CD/cassette, dining room, and well-equipped gourmet kitchen. Rooftop deck with panoramic ocean, golf course and sound views.